Can be used for competition running tracks, tennis courts, sporting halls and gymnasiums. Pre-school, kindergarten and school playgrounds, hospital areas, swimming pool and spa areas. Foot paths and walkways, washroom/restroom areas and ramps for handicapped people. 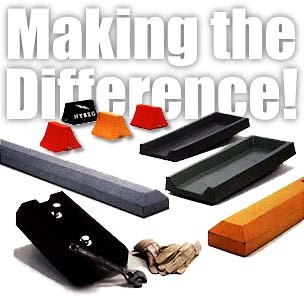 Useful truck and pickup bed liners, loading and off-loading ramps, bumpers and splash mud flaps and docking areas. Can be used for naval and merchant fleet or cargo fleet decking, wear areas in kitchens, bars or lounges, hospital bathroom floors. Ideal for use in foot paths, pedestrian malls, parks, playgrounds, patios, paddocks and stables, cow and horse barns. Day care facilities, school yards and more. Veterinary hospitals, horse floats, floors in livestock transporters, ramps and kick plates in stalls and others. (Geneva, NY) -- When thousands of tires went up in flames recently in Chautauqua County [New York], many people saw only billowing black smoke. But Robert L. Bates saw the loss of millions of new products - bumpers, splash blocks, speed bumps and wheel chocks, to name a few. Major US Supermarket chains find the low-maintenance "Sixty Pounder" parking lot sign base easy to use, and economical to own, especially when it comes to liability and damage to vehicle incidents. �1997-2010 Enviroform Recycled Products, Inc. All Rights Reserved.